A 48-hour strike by more than 300 workers at one of the UK's busiest ports has been branded "pointless" by the boss of the harbour. Members of the Unite union walked out at about 0700 GMT on Tuesday in a row over the privatisation of their jobs. 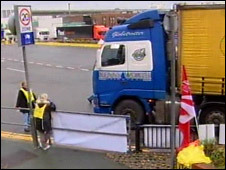 Dover Harbour Board chief executive Bob Goldfield said the strike action had failed to disrupt sailings. But Unite said the normal service had been interrupted and confirmed it plans another three-day strike next week. The second strike is due to begin on 27 November. Mr Goldfield said: "They are denying their families income in hard economic times and they are being misled by the people who are supposed to be representing their best interests. "It is highly regrettable that Unite, and those who purport to support the action, continue to give misleading and blatantly wrong information to the families of those on strike. "The fact that the union has declined the invitation by Acas to facilitate talks is irresponsible." Unite has said that if jobs are transferred to a private firm, its members will suffer. Bendan Gold, a union spokesperson, said: "We as a union have been very well experienced in outsourcing and the affects that has on workers' terms and conditions of employment. "There's a gradual but inevitable downturn in pay, hours and conditions of employment and pensions are not protected either. "Our members know exactly what happens - they've seen it in other industries." The harbour board wants to turn the former Hoverport at the Western Docks into a second ferry terminal with a new marina and four new berths. The board said a second terminal would help create 1,000 new jobs locally and also ease traffic problems. The 48-hour strike is due to end at 0700 GMT on Thursday.